Sitting Tenants | Selling Sitting Tenants? January saw a large number of vendors looking to cash in on the booming property market. Rightmove the online estate agent said that the number of sellers looking to sell their properties had increased dramatically compared to a year ago. They also said that they have had their busiest January on record as their website received £50m hits per day or 500 hits every second. Whilst the number of sellers had increased so has the number of buyers with buyers up 50% on a year ago. People are scared that they are going to miss out and there is a frenzy out there that has been created by the Help To Buy scheme and the cheap money that is being thrown at buyers. Some estate agents are reporting record numbers of buyers and in many parts of Britain house prices are up 10% on a year ago. Gazumping is also back and many houses that are coming to the market are being chased by more that one buyer which is also pushing up prices. Prices in London are now at an all time high of just over £450,000 which is also causing alarm amongst many commentators who believe that the government should consider pulling the plug on the Help To Buy scheme before the average price is pushed up to the 600k threshold. The government’s flag ship policy Help To Buy Scheme has been slammed by PricedOut. The organisation which campaigns for more affordable housing said that the whilst the scheme had help just under 19,000 first time buyers get onto the housing ladder a further 245,000 were now unable to buy a home because prices had spiralled out of control. The group has calculated English Housing Survey’s income profile of private renters along with figures from the Office Of national Statistics on the latest house price index to show that three-quarters of private renters could no longer afford to buy their own property. This is on the basis that a borrower would not borrow more that four times their income. With house prices predicted to rise by a further 8% in 2014 and wages growth not likely to increase significantly there is more concern that more first time buyers are going to be locked out of the market. Although there are other factors that are pushing up prices the shear volume of buyers that are out there along with the lack of new homes being built the Help To Buy Scheme may have the opposite effect of what is was rolled out for. Instead of helping buyers get on the ladder it is actually inhibiting borrowers from buying. Of course there are two sides to this and many commentators have said that the Help to Buy Scheme has been the main driver for the housing market and has pulled the country out of the recession but this still doesn’t help those that still can’t afford to buy. According to new figures released by Shelter, the housing charity, more and more council tenants are struggling with rent payments and going into arrears. Most of the arrears have been put down to the bedroom tax that has been introduced by the current government. The arrears have also been attributed to the low-income growth and the rising price of fuel. With the current strain on incomes the outlook is bleak for tenants that are struggling to make ends meet. Current figures suggest that 1 in 3 tenants are in arrears and data collected shows the number of tenants in arrears has reached 50,000. None of these tenants were in arrears before the changes came into force. The government is trying to reduce the amount of money that is spent on welfare. Welfare payments account for £1 in every £3 that is spent. The government has said that the taxpayer will save £505m for 2013 -14 and £540m the year after. 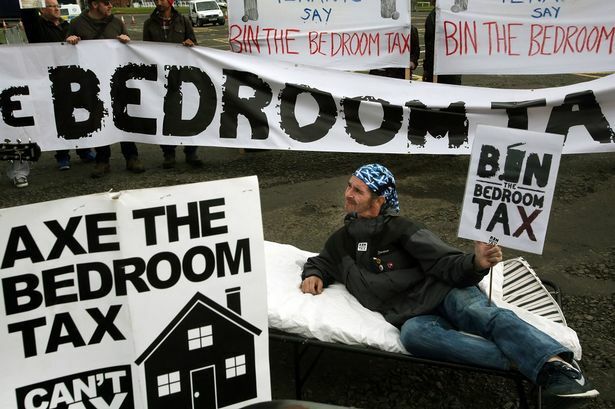 There have been calls from the Labour party to scrap the bedroom tax as it is unjust. Ed Milliband has promised to scrap the tax if they get elected. If you are selling with a sitting tenant we can help you. We pay up to 90% of vacant values for properties with sitting tenants. We offer a one stop service for landlords. Fed up with your tenants? Many tenants are unwilling to allow viewings on their property which can sometimes make the property difficult to sell. Most of these tenants have been in residence for many years and quite rightly have the right to refuse entry to anybody. This is not a problem for us as we can buy your property without an internal viewing! Therefore when a sale takes place on a protected tenancy the buyer will generally have to purchase the property without actually viewing the property internally. This can sometimes cause a problem if the house or flats is not a run of the mill property which means the buyer will have to take a view on the deal. Of course a discount will apply for these types of investments as the tenant has the right to stay in the property until they die or decide to move out. Very few tenants move out because they have a good tenancy and will never get another tenancy on such favourable terms. You may be wondering why an investor would want to buy a protected tenancy and the answer is quite simple. Eventually the property is going to become vacant which is when it can be sold hopefully for a profit. Providing house prices increase the landlord will sell the house when it becomes vacant. From a landlord’s point of view you need to have capital to invest in these investments because they are unmortgageable in the current climate. So if a protected tenancy is sold for £250,000, it must be bought with cash as no bank will lend against it. Therefore you have to leave the cash in the property until it becomes vacant which could be twenty years or more from now. Of course you might get lucky and the house may become empty 12 months after you have purchased it but this is definitely the exception rather than the rule. These properties are acquired for the long-term and you should not expect the house to become vacant in the near future. The tenant has security of tenure which means that they can stay in their home until they die. You are not able to increase the rent of your own accord as this will be done by the rent office or the rent assessment panel that deals with most aspects of the tenancy. You will be entitled to a rent increase every two years. The increase will be linked to the retail prices index and normally takes a couple of weeks to be implemented. These types of tenancies are not for everyone as they do require a little specialist knowledge and considerable cash reserves. We have been buying these houses and flats with sitting tenants across Britain and would welcome the opportunity to discuss your tenancy with you. Please call our offices for an informal chat. Ground rents Freehold Ground Rent investment company. Sitting Tenants Blog Welcome to our blog about sitting tenants. Discover how you can sell your house with a protected tenant and how the value is affected with a tenancy of this nature.